Had a bit of a brain wave. There I was, smashing some steel plates together, and I thought, 'yes, it's deadly!' But what's missing? What's missing? And I thought lots of sharp bits welded onto the flat bits. A Crusher in Portal 2. 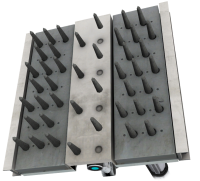 The Crusher is introduced in Portal 2, and is a derivative of Aperture Science's Panel technology. Crushers are an environmental hazard present in several test environments. If a test subject makes contact with a Crusher, they will be forced into the nearest hard surface and killed instantly. Crushers appear as large grey panels with a number of steel spikes firmly attached to them. Crushers become more frequent during the final parts of the game (particularly in the chapter The Part Where He Kills You), and also appear frequently in Cooperative Testing Initiative. Any object, including the player, will be perforated instantly upon contact with a Crusher. When active, a loud crunching noise is emitted in order to warn the player that they are approaching a Crusher, thereby allowing the player to avoid them. In Co-op mode, if the player comes in contact with a Crusher while floating in an Excursion Funnel, the damage caused will be periodic until the player moves away or dies. Crushers were originally intended to appear in Portal, but were removed in the early stages of game development due to the additional complexity Valve added to test chambers. Crushers appear in Portal: The Flash version, a 2D flash game released prior to Portal. Later, they appeared in the Portal: The Flash Version MapPack modification, and were eventually reintroduced into Portal: Still Alive. They also have appeared in fan-made mods, including Portal: Prelude and Portal: Project-Beta. According to Wheatley, Crushers originally lacked spikes and were ordinary steel plates before he modified them, believing that there was something missing. This contradicts with the Panels Investment Opportunity video as a Crusher is clearly visible in the last part of the video, and that GLaDOS had also used a Crusher during Chell's fall into the Emergency Intelligence Incinerator at the end of chapter The Courtesy Call. An icon of a Crusher can be found in the Puzzle Creator's files. Wheatley refers to crushers as "mashy spike plates". The early Portal crusher, as seen in Orientation Video No. 1. The unused Crusher icon in Portal 2's puzzle creator mode. This page was last modified on 4 April 2017, at 01:55.